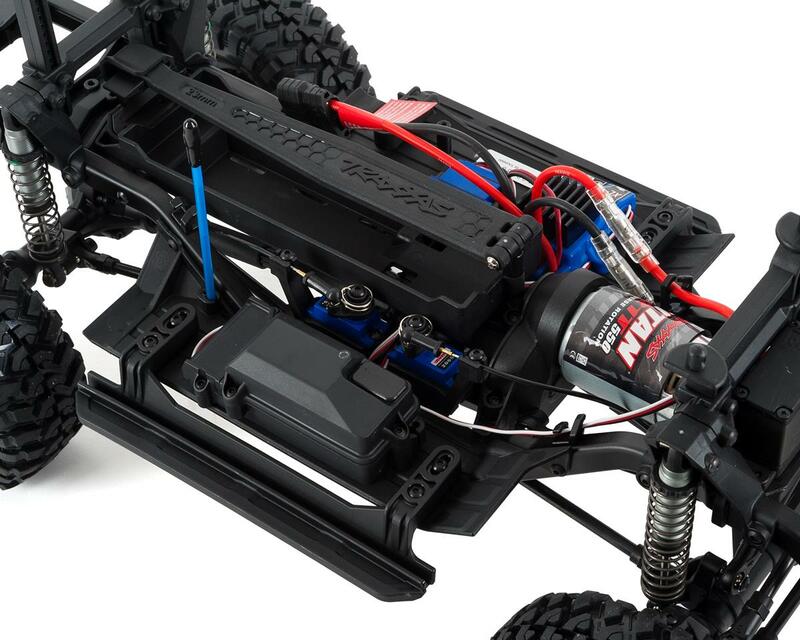 The Traxxas TRX-4 Scale and Trail Crawler is a ground breaking product that could only come from Traxxas. 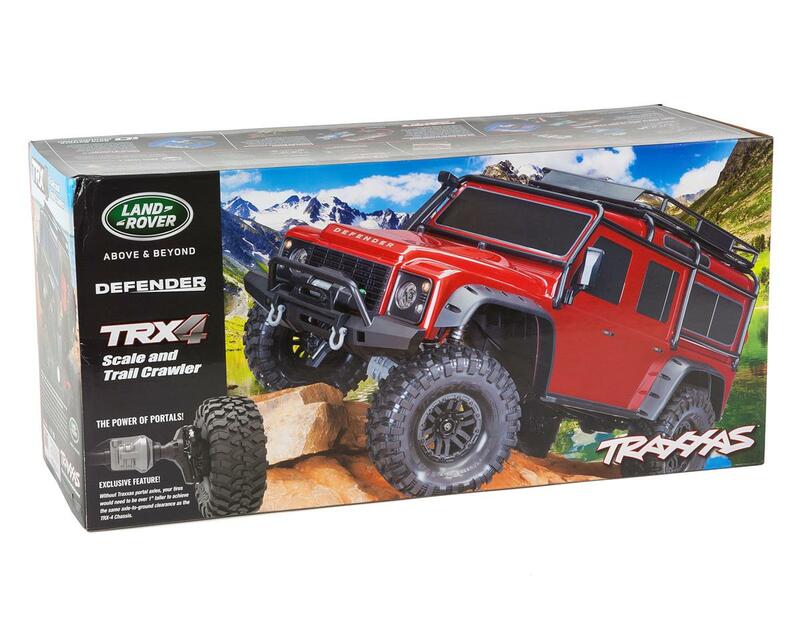 With a feature set that includes parts that you would expect to buy separately, the TRX-4 delivers versatility and capability in a fully ready to run package. 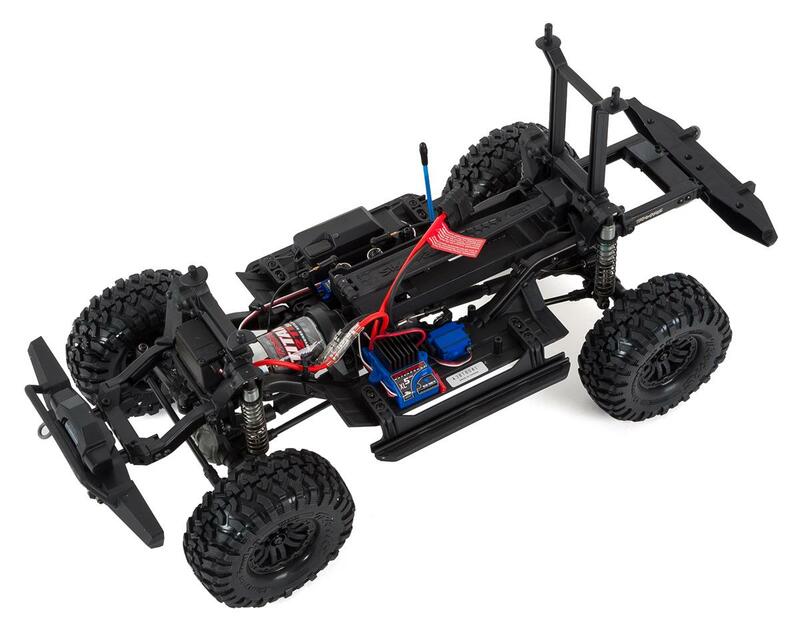 The TRX-4 is built for crawling the Traxxas way - rugged, powerful, and ready for fun! Traditional crawlers sacrifice turning radius for traction. The TRX-4’s remote locking differentials disengage to take full advantage of its superior 45 degree steering angle. Once you clear the obstacle, re-engage the differentials for ultimate traction. 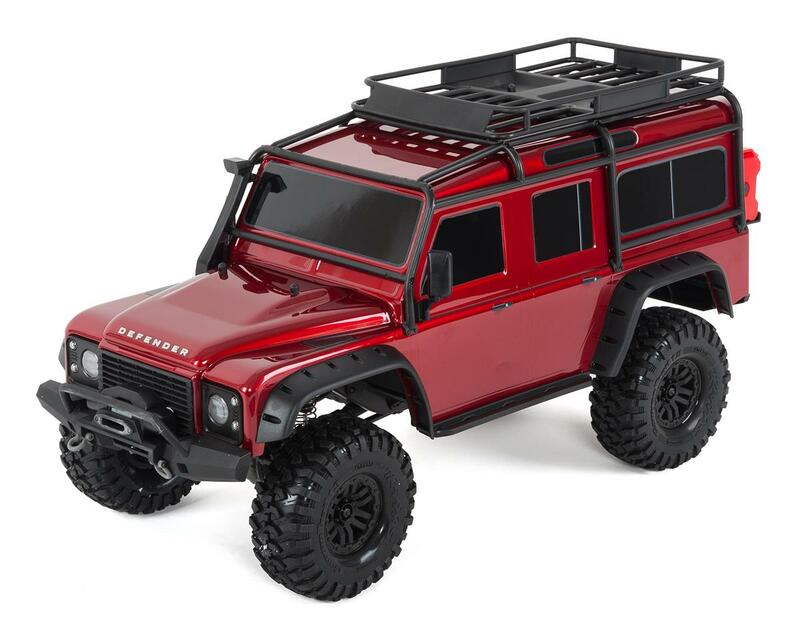 The TRX-4 Trail and Scale is being shown with the legendary Land Rover Defender body, complete with exciting scale details for an authentic 4-wheelin’ experience. Traxxas included a functional spare wheel and tire, an off-road jack, and spare fuel canisters. Secure your trail gear in the included roof basket. There’s even a snorkel for taking the waterproof TRX-4 through creek crossings. The rugged bumpers provide clearance and protection and are equipped with recovery D-rings. The front bumper is designed to be compatible with many popular off-road accessories. The scale details did not stop with the body. 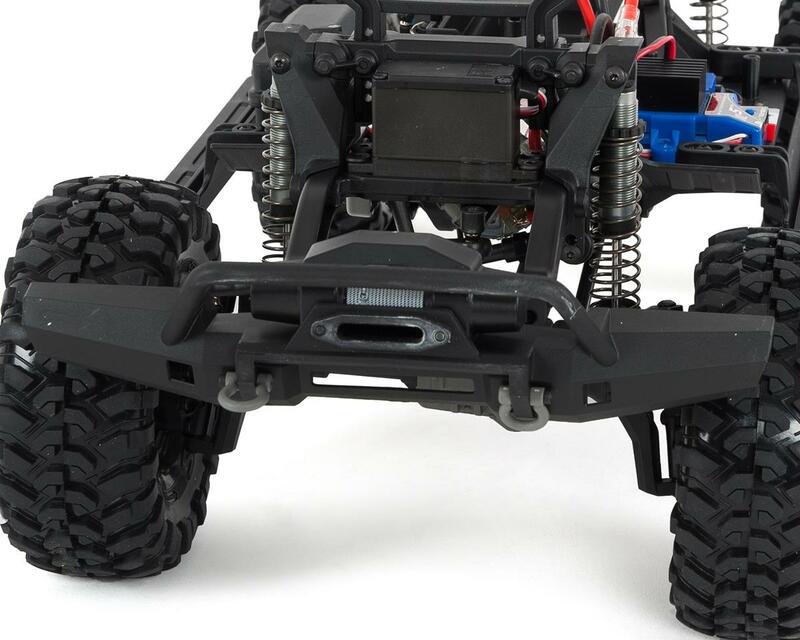 Traxxas went underneath to install detailed inner fenders that integrate with the scale look of the floor pans and shock towers, keeping rocks, mud, and twigs out of the chassis. The inner fenders are also equipped with pockets to install optional LED rock light kit (sold separately) to light up the night trail, casting light right where it’s needed. The rock lights make changing a “flat tire” on the trail a breeze! Integrated rock sliders help protect the body from damage. 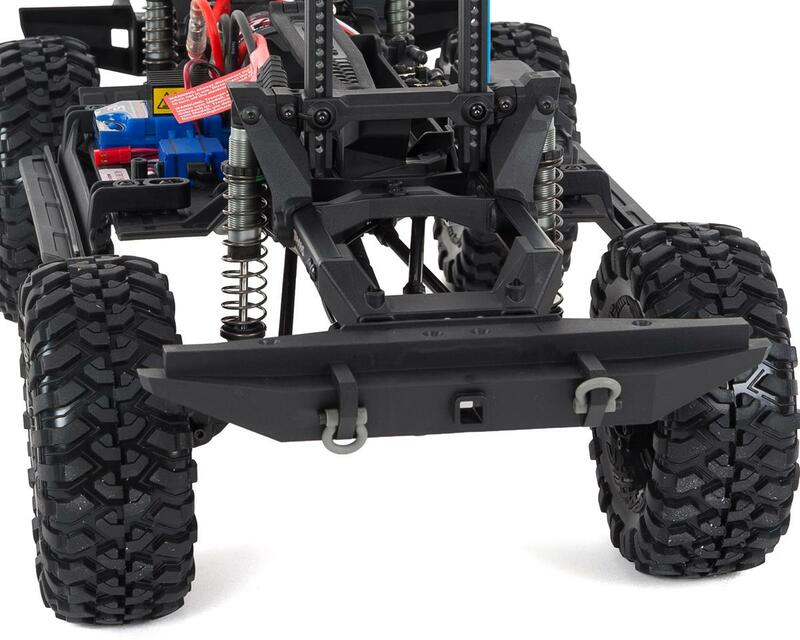 Steep approach angles front and rear allow the TRX-4 Scale and Trail Crawler to tackle big obstacles head on. The front motor design biases weight forward for superior climbing ability compared to other designs. The TRX-4 Defender has awesome reviews and has about every crawler feature anyone would want. Traxxas has a great reputation and product line best known for a combination of toughness, parts availability and feature sets. I've owned and enjoyed a low chassis Slash 4x4 for a couple of years and it has been great. 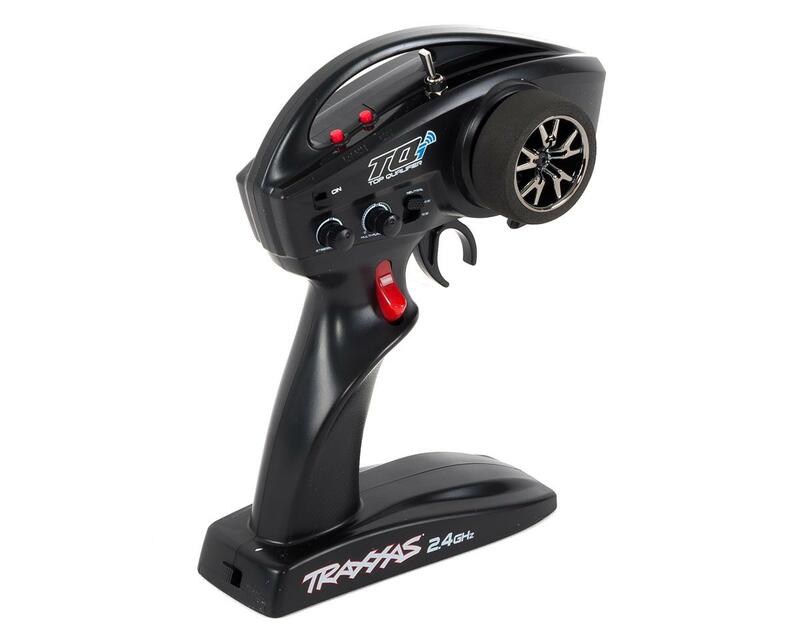 Never trust a review that misspells "good", "Traxxas", and "garbage" all in one 11-word, poorly punctuated sentence. Quote: "the only god traxxis. everything else this brand makes is garbooo)"
Currently I own an axial SCX 10, as well as a axial yeti score trophy truck, As well as also having an airplane,a small helicopter,A 39 inch pro boat V bottom boat, and lastly my new, and I have to say most favorite now Traxxas TRX-4. This RTR is amazing, very stable, good looking, and just about everything you could ask for in a crawler. The only thing I can comment on is how well it's going to hold up, this remains to be seen. Although I do have to say I have good vibes, I'll keep you informed. 6 customers found this review helpful. TRX-4 is great it climbs hills on steep up hill grade like no body's business. It is definitely top heavy and will roll if your not watching your approaches. I have had tovreplace the steering servo horn as the plastic stripped out in 3 drives going down hill. Love it. . This is an amazing truck. All of the parts on it are quality and don't break easily. I would recommend this truck to anybody. Good day dear sellers!!! Happy with the purchase. Great model! Thanks to support for a simple return to the battery. PS battery ordered by mistake. Good people work in this shop. Thank you!!! Just got it and I didn't have much time to put it through its paces but I love it so far. I have several Trail Trucks in its class from Traxxas and other manufactures but I can tell already that this is going to be one of my favorites. So far I like everything about it. I will get back with a full review in about a month or so. I love this truck! It is so much fun to drive around and over rocks,sand,wood and everything else. The Land Rover Defender body looks great. I strap drinks, beers and water on the rack to deliver refreshments to my family and friends while we're camping. They get a kick out of it! Some minor issues I found is that the gear shift sometimes does not engage properly where it seems to be in between hi and lo gears so I would hit the throttle and it doesn't move. I will then need to shift a few times until it engages. I also noticed that the portion of the chassis where the Traxxas logo was etched in to bear metal had started to rust a little. I will sand it out and paint over it. The steering servo also went out after a few days which I expected from reading reviews that the servo is too weak for this size truck. I had a spare so no problem but it was inconvenient. Other than that it's a great truck. It's not super fast on 2s lipo but I didn't get it for speed. Seeing it bouncing around on the beach makes you feel like like your on Safari! It does tip over easily but it's because of the top heavy body.I put the traxxas light kit on it and it completes the look. Looking forward to hooking this up with more accessories. The Defender was my first Traxxas RTR. It is a bit top heavy, but that's easy enough to fix lowering the center of gravity with some of the optional weight accessories and widening the wheel width a bit. Great Crawler with nice accessories to make it stand out. Lucked out with mine and got one with the newer upgrades. Very happy with it. This truck is a beast. But is a little top heavy. Glue in wheels. I have 25 RCs and i'm going to have 26 when i purchase one of these. I have redcat/axial/hpi/ruckus/traxxas/blade/pro boat and some i built my self.there all great. you dont need to know how to (SPELL) but you do need to know how to drive rcs.some people can't get the hang of it. Thank you so much! Delivery is very fast! The car is great! I hope will last a long time! 1 of 31 customers found this review helpful.